I love enchiladas. I remember my dad making them when I grew up. Of course, his were a little different than mine. 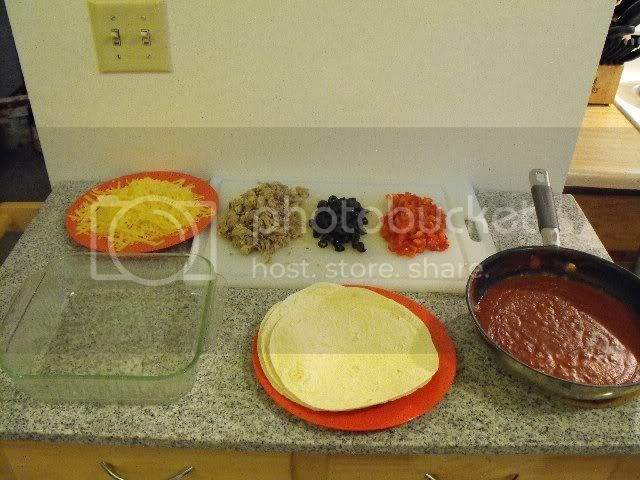 For instance, he used corn tortillas. 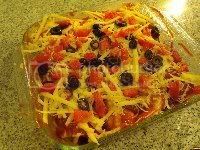 And he seemed to like cheese-only enchiladas. I kind of liked 'em like that. But I've discovered that my wife doesn't seem to like cheese-only enchiladas. And I got fed up with corn tortillas long ago. They crack when you try to roll them, they... well, they crack. Isn't that bad enough? 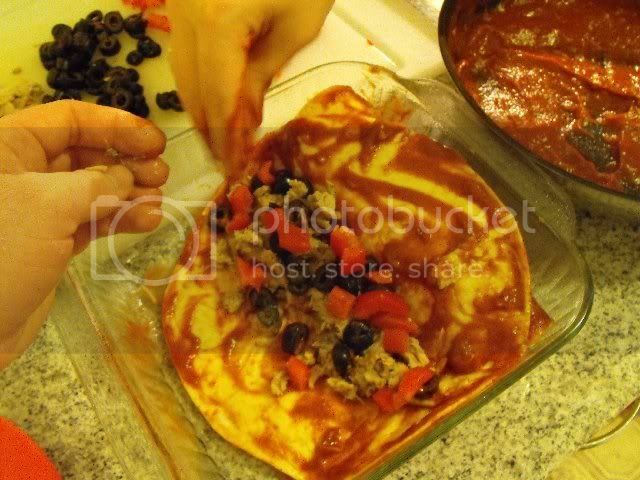 Lately I've been playing with enchilada sauce. Really, isn't it just a thinned out tomato and chile sauce? 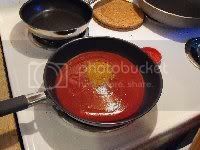 I decided to try a little experiment: canned tomato sauce plus taco seasoning. Hey, it's actually not bad. It's a little thick, but it's very close in flavor to some of the store-bought enchilada sauces. 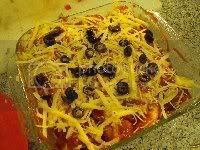 So bearing all this in mind, let me share with you an enchilada recipe that my family has been eating on occassion lately. It's not exactly traditional, but we like it. But if you want to go back to corn tortillas or something, go for it. You won't hurt my feelings. 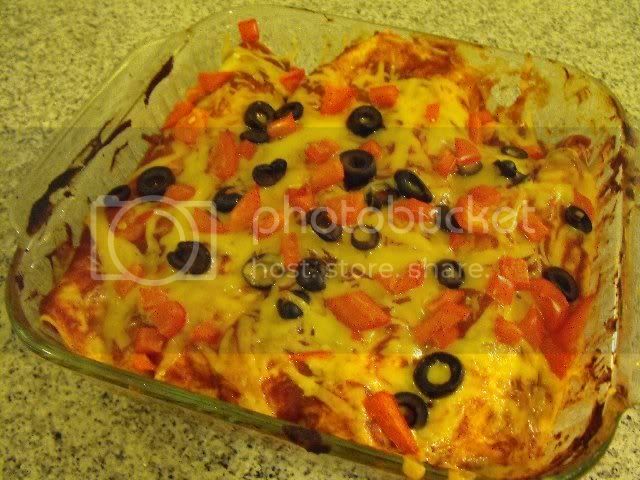 First off, you'll need your enchilada sauce. Whether you use the "real" stuff or you do it my way, it helps to heat it up. 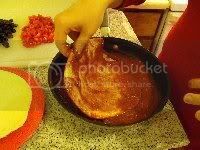 I like to use a wide frying pan, to have enough room to dip the tortillas in later. 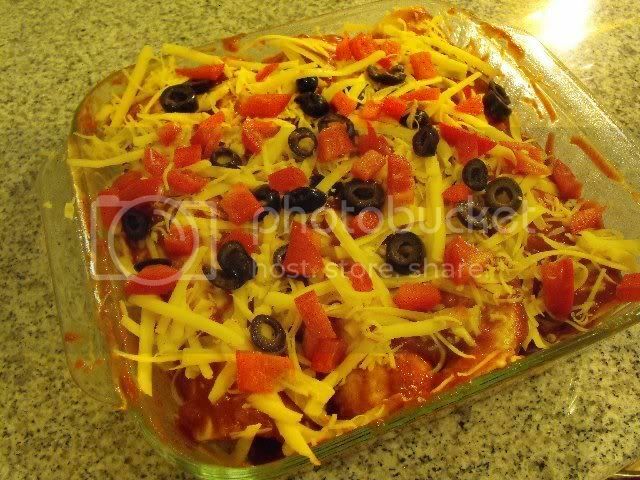 With my version, you need a can of tomato sauce and a couple of Tablespoons of taco seasoning. Stir it all together and heat it up to about a simmer. You don't need to boil it or anything, it just needs to be heated a little. If you want, you can thin it out with a little bit of liquid. Water would be fine, but broth would be better. 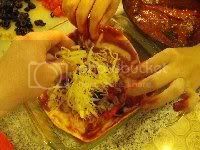 Once it's ready, put it together with the rest of your ingredients and equipment. 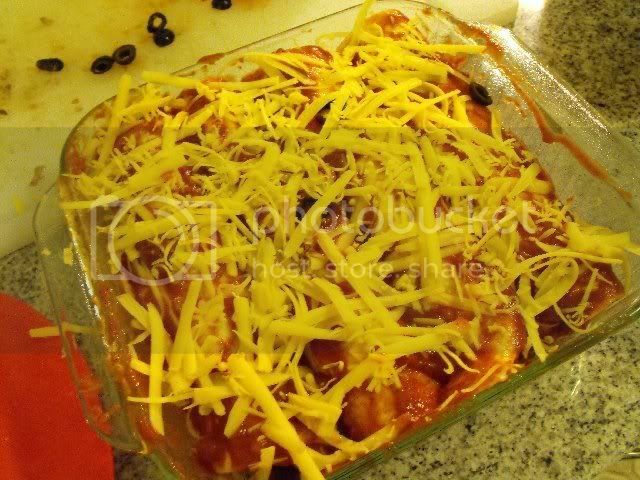 Slide it into the oven at 350F, until the cheese starts to bubble. It'll probably take about 15 minutes or so. 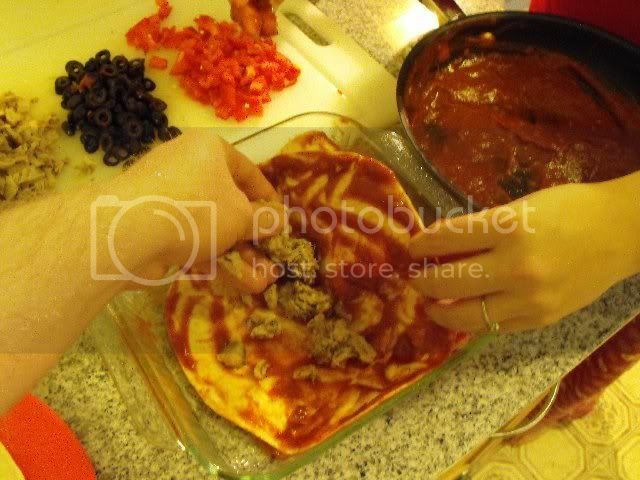 Your recipe looks good. 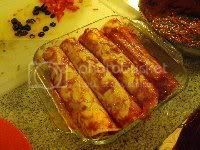 As I was growing up, we always made our enchiladas like a lasagna. 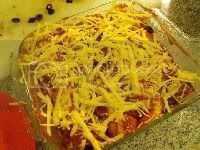 It's easier to layer everything in the pan, than to bother with rolling it up. 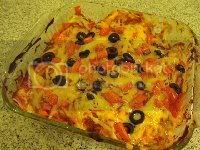 My mom had me do that all the time - called it enchilada casserole.